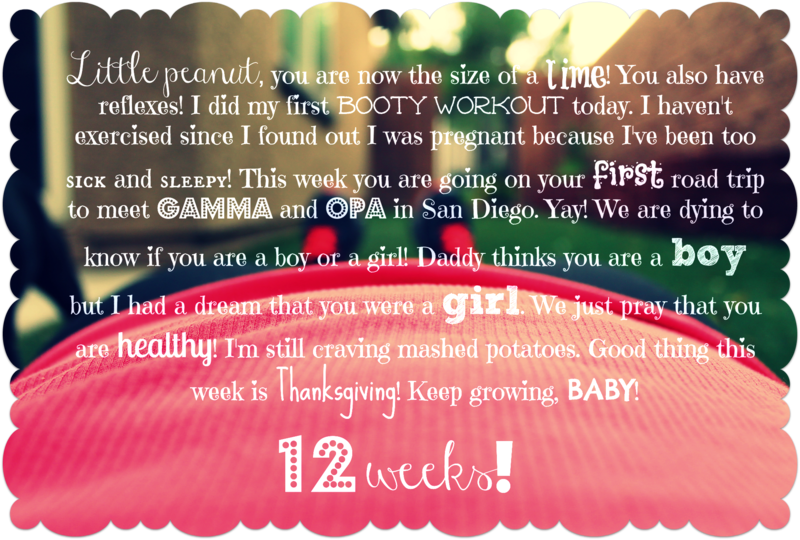 akupofkatie: 12 weeks and counting! A. These hormones are INSANE. B. I have so many happy tears. C. Thank you for all the kind words and well wishes to us from all over the globe. We are truly grateful and humbled by all the love. We have SO much to talk about, don't we? I will be posting updates with fun little pictures like the one ABOVE. I know all the females are dying to see belly pictures but I wanted to go with a different update other than the cute chalkboard updates! I love those but I want to turn mine in to a book after so this is what I'm rolling with. That is my belly pictured above! I hope you're down with that! The four of us, (MVP, me, Halo, and baby), will be traveling to San Diego tomorrow for Thanksgiving. Have I mentioned I'm excited? First of all, being pregnant on Thanksgiving is such a treat. Let's be honest, the food is going to taste SO good. You know what I'm even MORE excited to do? Frisbees, sunsets, board games, good talks, and probably a lot of laughs (and flatulence)! Well, I need to go eat something before I want to barf. Morning sickness 24/7 sickness BLOWS. ps: If you've emailed, called, or texted in the last month or so and I never responded...I'm SORRY! I feel like I've been in a coma and I'm just now coming back to life. I'll get to you. Promise. My book recommendation is Raising Bebe. Girl, I have been so out of the blog world (and everything else not related to my new crazy life!) I didn't know you were preggo!!!! HOLY COW!!!!!! Congratulations!!!!! ME TOO!!! I just announced it yesterday, so don't worry. Hows MARRIED life????? ?